What are the fumes that form above liquid nitrogen? What is the composition of liquid nitrogen fumes? Is direct contact with these fumes harmful? 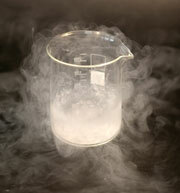 Liquid nitrogen has a relatively small heat of vaporization, as these things go: 199.2 kJ/kg according to Air Liquide. (Compare 572.2 kJ/kg for dry ice.) That plus the Leidenfrost effect means it's actually rather difficult to freeze yourself with the stuff. There's a standard demo where you pour liquid nitrogen into an audience member's cupped hands. The Leidenfrost effect prevents it ever coming in contact with their skin, and it only leaves a mild chill behind. Try this with dry ice and your "volunteer" will need emergency treatment for frostbite. Gaseous nitrogen is second only to the noble gases in its inertness, and it makes up 78% (by volume) of the air you're breathing as you read this, so obviously the "fumes" aren't harmful in themselves. However, as was mentioned in an earlier answer (which seems to have been deleted), if you let liquid nitrogen evaporate in an enclosed space, it can "displace" the oxygen that makes up another 21% of the air, at which point anyone in the area may asphyxiate. The sensation of suffocation is triggered by having too much CO2 in your bloodstream, not by inadequate oxygen supply, so you might not even notice that anything was wrong until you collapsed. That's the second most dangerous thing about evaporating liquid nitrogen. The most dangerous thing is, if you let liquid nitrogen evaporate in a sealed container, it's liable to explode on you. The fog / vapor / fumes that come off a container of any liquefied gas will be a combination of condensed water vapor and whatever it is that is boiling. It is no more or less dangerous than the gas itself. In the case of nitrogen, oxygen, helium, neon, argon, sulfur hexaflouride, methane etc. you can put your nose right up to the liquid's surface and take a really deep breath, no harm will come to you unless you are stupid enough to breathe it for an extended period. Oxygen, of course, is the exception but too much O2 is bad for you as well. Don't try it with chlorine. Regarding the Leidenfrost effect and pouring liquid N2 into someone's cupped hand, lets be sure the palm is facing down, not up. Leidenfrost only works for a couple of seconds on room-temperature objects like people. Not the answer you're looking for? Browse other questions tagged physical-chemistry safety molecules or ask your own question. Why does oxygen not condense onto open dewers of liquid nitrogen? Is it possible to make liquid nitrogen with a bottle of CO2 gas and a freezer? What are possible hazards of fog machines? When dispensing liquid nitrogen, why does the surface get wet rather than frozen? Liquid nitrogen superheating with a layer of oil? What is the liquid coming out of these Duracell batteries? What should I do about working in a laboratory that I believe is unsafe?